More than a billion children worldwide—95 percent—are in school. That’s due in part to steady progress toward the second Millennium Development Goal that every child “be able to complete a full course of primary school” by 2015. 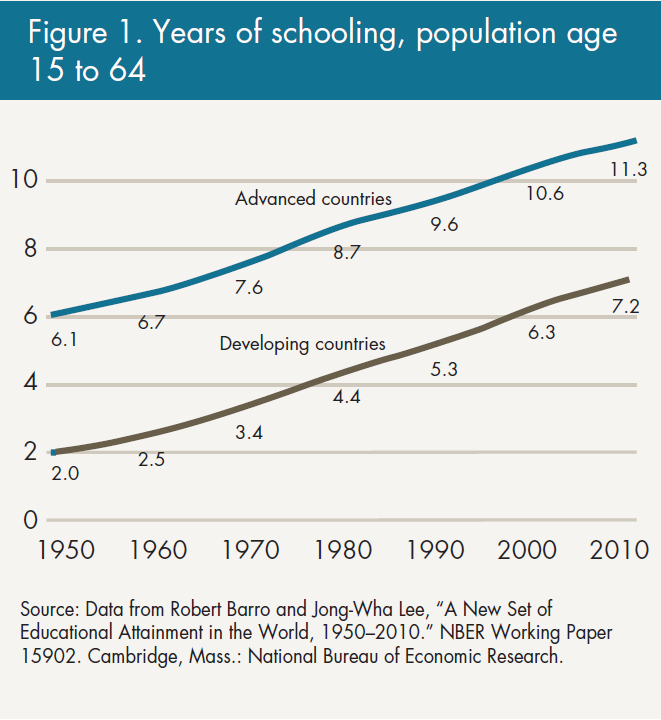 To put that in perspective, the average adult in the developing world today receives more schooling than the average adult in advanced countries did in 1960. Schooling, however, is not the same as education. Few of these billion students will receive an education that adequately equips them for their future. The poor quality of education worldwide constitutes a learning crisis; donors and development agencies have been complicit in its creation, but they can and should be part of the solution, not by prescribing changes, but by fostering environments where change is possible. More kids are in school now than ever before (see figure 1). International attention to improving enrollment and targets such as the second Millennium Development Goal have had much to do with that improvement. But while there have been many schooling goals, there has been no international education goal, and schooling—to make one thing clear—is not the same as education (as the data below about the dismal rates of learning will attest). The goal of basic education is to equip children with the foundational skills, abilities, knowledge, cultural understandings, and values they will need to successfully participate in their family, society, polity, and economy. 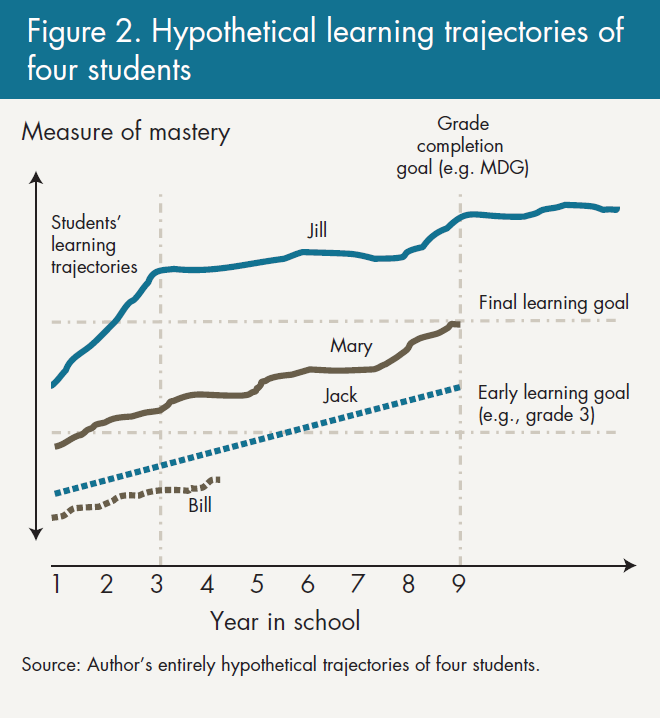 Education may be harder to measure than counting kids in school, but breaking broad objectives into a series of specific time-bound learning goals such as reading fluently by age 10 makes such measurement possible. The contribution of schooling to education can be visualized as a learning profile, with two components: grade attainment (how long you stay) and grade learning (how much you learn per year) (see figure 2). The first often doesn’t lead to the latter—learning trajectories in the real world are just too darn flat. Assessments from India, Bangladesh, Pakistan, Kenya, and Tanzania, among others, show that half or more of children complete primary schooling unable to read even the simplest texts or perform simple arithmetic (see figure 3 for an Indian example). 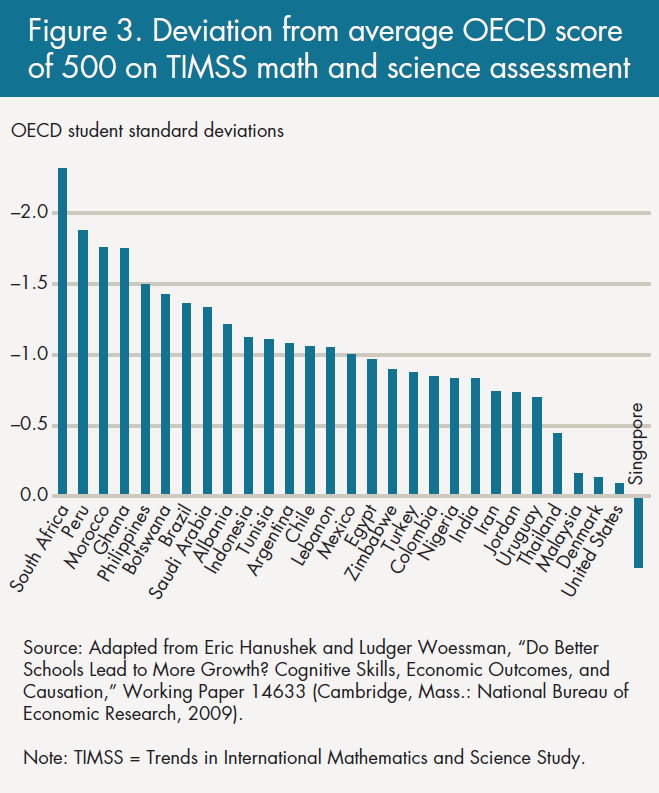 International assessments show students in developing countries far, far, below international norms—even high-performing students in Tamil Nadu or Peru perform more poorly than a mediocre student from an OECD country (see figure 4). A common reaction to the learning crisis is a cry for more inputs. Nearly all developing countries have plans to spend more money on education, but decades of accumulated evidence show that more of the same will mostly reproduce more of the same. 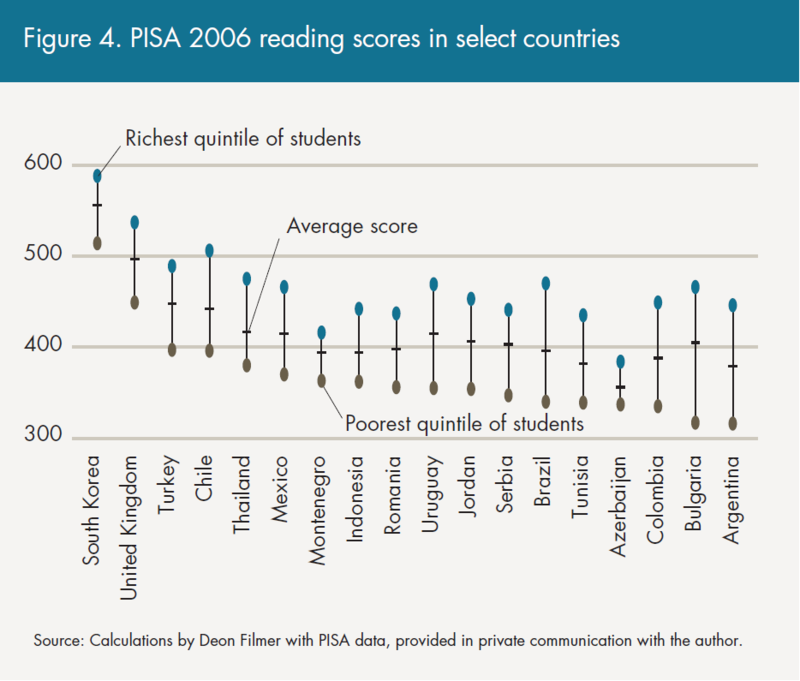 What countries need are evidence-based plans for achieving significant progress in learning. 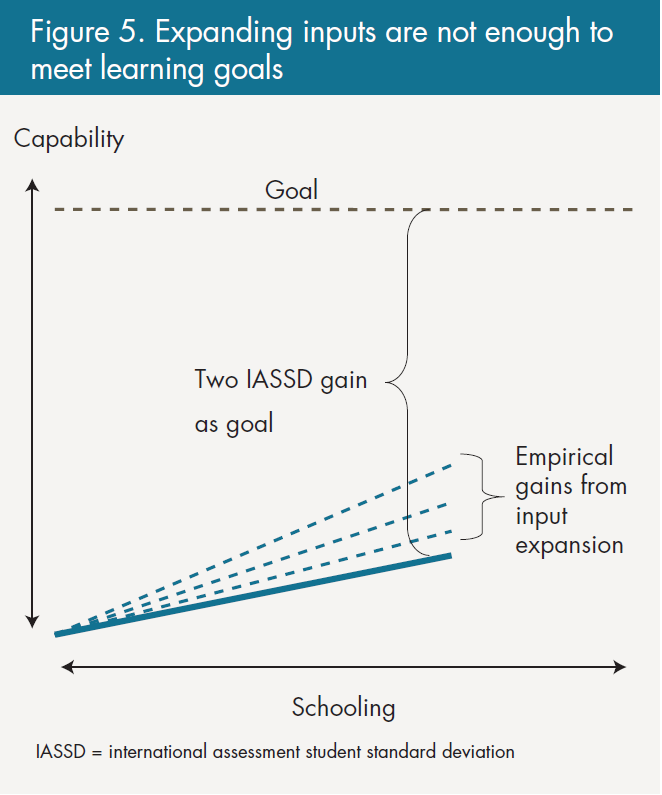 One simply cannot produce the magnitude of improvements needed to close the learning gap between rich and poor countries by doing more of the same (see figure 5). That’s the first lesson: don’t just focus on inputs. More of the same won’t cut it, and more “best practice” won’t either. The pedagogical challenges in developing countries are entirely different from those of advanced countries. Replicating the latest best practice without systemic change will not produce the sustained dynamic needed for better schools. Success is more likely to come from disruptive innovation than mimicry of best practice. Second lesson: don’t imitate the West . School systems in many countries are centrally controlled by large, top-down national or state/provincial bureaucracies that hand down decisions about which schools get built, where teachers get assigned, and what subjects are taught. Well-functioning centralized systems can efficiently carry out logistical tasks and scale up quickly and inexpensively, as the success in expanding the number of school buildings shows. But a centralized system cut off from the judgment and concern of local parents and teachers is doomed to succeed at schooling but fail at education. Lesson three: don’t force centralized systems. There are no easy solutions in education. As the three lessons above imply, solving the learning crisis will require flexible policies that allow developing countries to experiment with their own approaches and solutions. No single intervention or innovation will transform failing schools or provide children with the opportunities they need for the 21st century. While there is no universal prescription for education, the international community can help foster environments where change is possible. Educators, governments, and donors need to pivot from focusing exclusively on enrollment to focusing on learning. Fortunately, some governments, development agencies, and organizations have already taken the lead in this shift toward learning, including, in some programs, USAID, DfID, and the World Bank. Today, national governments and development agencies have an enormous amount of data on schooling: enrollment, grade progression, completion, budgets, expenditures, and so forth. But there is almost no information on the educational attainment of any given cohort. Globally, how many 10 year olds can read fluently? How many 15 year olds today are ready for their future? No one knows. Gathering data on cohort learning and constructing cohort learning profiles should form the basis on which countries could create evidence-based plans for improving learning outcomes and measure the success of new strategies and interventions against true education goals. Open: Many different types of schools provide education, with distinct approaches allowed and encouraged. Locally operated: Actors are allowed the autonomy to operate, explore, and discover their own ways of operating. Performance pressured: A combination of common standards and measurement for “thin” accountability on outcomes from above and “thick” accountability inside schools and inside school communities from below guides development. Professionally networked: Teachers, the key to any system, are embedded in their school but are also networked horizontally in communities of professional practice. Technically supported: The system gives support to schools and teachers to provide them with the capabilities to succeed. Flexibly financed: Finance follows students and performance, with local control of allocations. Community-controlled schools, in which groups of parents, affiliated with the most local level of government, are free to open their own schools (subject to some requirements) and attract students to the school. Private providers, both for profit and nonprofit, to provide schooling, with some formula for how resources mobilized from the public sector might follow the student. Schools under small governmental jurisdictions that would not quite allow school-by-school autonomy but something very close to it (an approach that is not the typical “decentralization”). Charter systems in which schools are permitted and regulated by the government but allowed much greater autonomy. Adopting new education systems will come at a price, but it’s not a financial one. Studies have shown again and again that the disruptive innovations that lead to learning improvements can actually save money. The price of better education is allowing freedom, giving choices, and hence ceding power from centralized bureaucracies to engaged educators and concerned parents and communities. For education systems to evolve to meet the needs of the 21st century, the powerful must cede their control over education to make way for systems that give greater control to local officials, parents, and teachers. The reward would be the rebirth of education that is suited for today’s world and equips youth for tomorrow’s. This brief is based on Lant Pritchett, The Rebirth of Education: Schooling Ain’t Learning (Washington: Center for Global Development, 2013). The Center for Global Development is grateful to the UK Department for International Development for support of this work. This list draws on Ori Brafman and Rod Beckstrom, The Starfish and the Spider: The Unstoppable Power of Leaderless Organizations (New York: Penguin, 2006).